DECLAN Devine reckons if Cork City are under pressure after a stuttering start to the season then the rest of the league must be in real trouble! John Caulfield’s side opened the 2019 campaign with a President’s Cup defeat to Dundalk and two losses from their opening two league fixtures against St Pat’s and Waterford. The Rebels finally got their season up and running on Monday with a narrow 2-1 victory at Sligo Rovers and City boss, Devine warned Caulfield’s side, who are still built around the double-winning team of 2017, demand respect. Devine was the last Derry City manager to secure a victory at Turner’s Cross back in March 2013 and there have been 27 unsuccessful visits since. Therefore he expects a tough night on Leeside. “If there’s pressure on John Caulfield then we’re all in trouble,” said the Derry boss. “At the end of the day he’s been winning leagues and cups. John knows the game, he knows his players and knows how to win at Turner’s Cross. “We go in with confidence but also with respect,” said Devine. “We have to be respectful, first and foremost of the league because anybody can beat anybody. Cork have been challenging Dundalk for league titles and cups for the last four or five years so they demand respect. 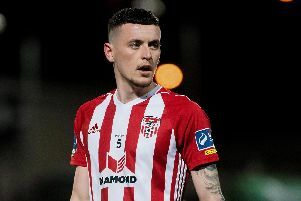 Derry City boss, Declan Devine says Cork City and John Caulfield demand respect. And Devine isn’t reading too much into Cork’s underwhelming start. “In the first six weeks, everybody is finding their best team, best formation and style of play and everyone is getting fitter. “John Caulfield has knows this league inside out and is a manager who demands respect. I definitely respect him.